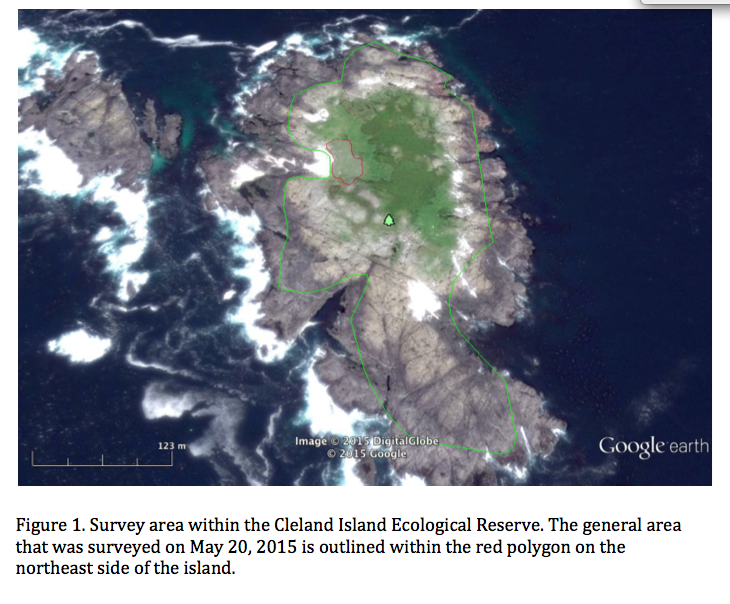 This report describes the results of a 3.5-hour survey of Wandering Salamanders (Aneides vagrans) at Cleland Island on May 20, 2015. 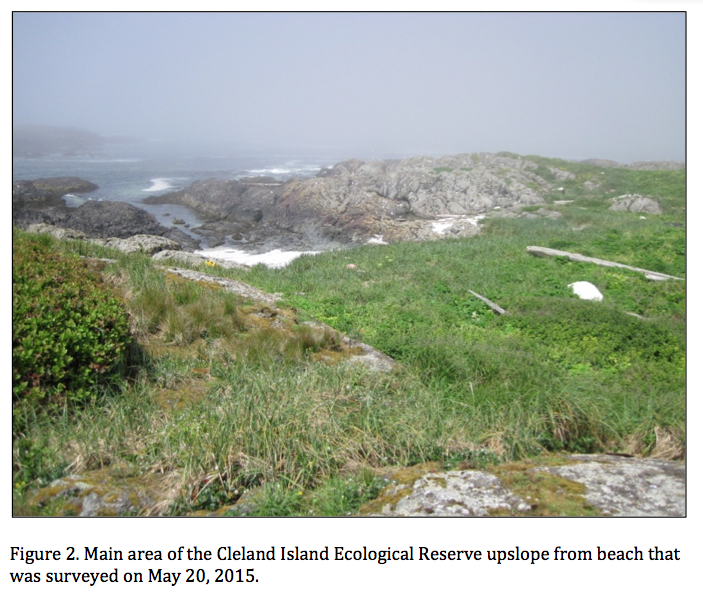 I searched under logs, Styrofoam and plastic floats, rotting cabin boards, and rocks within an area of approximately 1500 m2 on the northeast corner of the island just upslope from an exposed beach (Figures 1 and 2). All the searched cover objects were within 30 m of the beach. Approximately 75% of the objects that I turned over had at least one salamander beneath them. 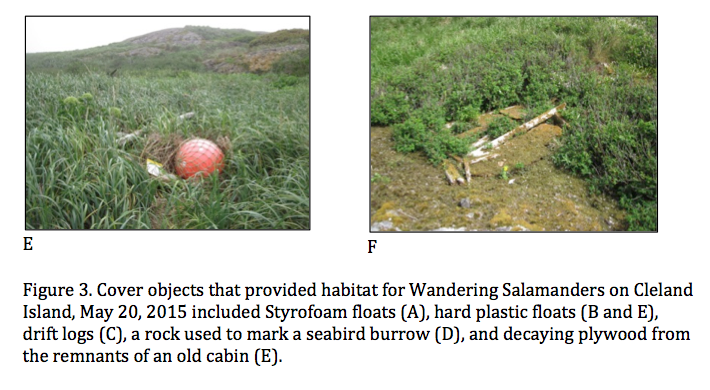 The underside of larger objects being used by nesting Storm Petrels were immediately replaced and not searched for salamanders. I recorded 23 individual Wandering Salamanders, 10 adults (> 50 mm SVL), 11 subadults, and 2 of unknown age (Table 1). One of the subadults was dead when I found it, likely after being squashed under a piece of driftwood that I turned over. I collected it, as well as small samples of tail tissue from 6 other individuals, stored in vials of 95% ethanol for storage until genetic analyses can be arranged. 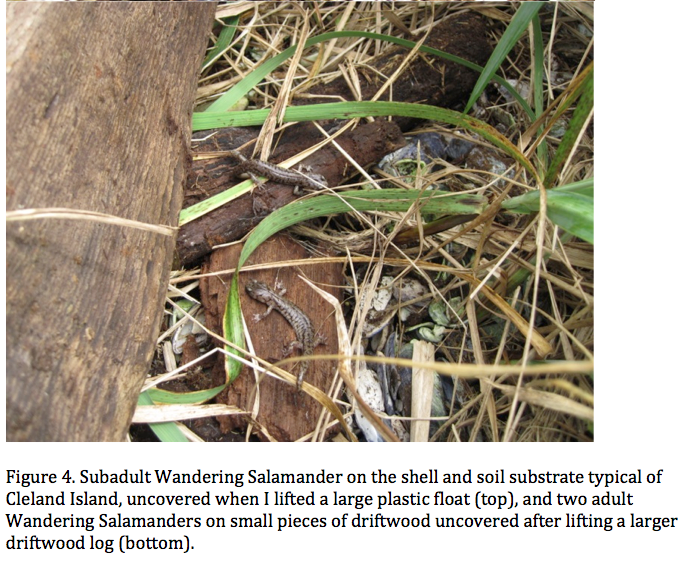 Fifteen salamanders were underneath cover objects that had been washed ashore onto the vegetation above the beach (Figure 3). 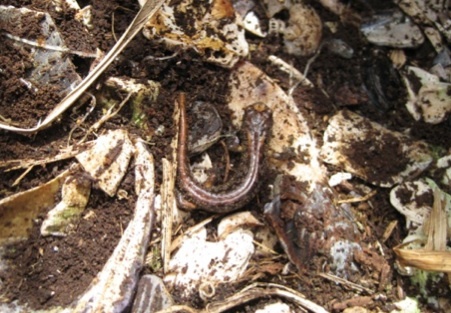 One salamander was under a flagged rock that had been placed to mark the entrance of one of the Rhinoceros Auklet burrows. Seven salamanders were under plywood boards of an old cabin that had been built on the island and fallen down. 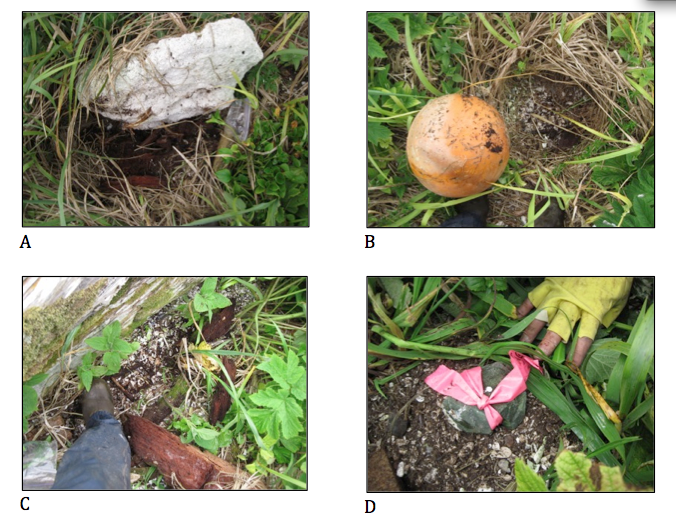 The substrate under the cover objects was a mixture of broken shells and soil (Figure 4). The vegetation was comprised mainly of dense sedge (Carex spp. ), Stinging Nettle (Urtica dioica), and Seawatch (Angelica lucida), as well as a number of other flower species indicative of nutrient rich soil, including Monkey Flower (Mimulus guttatus) and Fringecup (Tellima grandiflora). The highest density of Wandering Salamanders was under a section of rotting plywood that was part of the remains of an old cabin on a level portion of a rocky knoll approximately 20 m upslope from the beach. I found 7 individuals under a 25 cm x 25 cm section of board. I suspect that there were many more under the rest of the boards in that area but I could not search further without disturbing a nesting Storm Petrel. In addition to the salamanders, I noted the presence of several terrestrial molluscs under the cover objects: Banana Slug (Ariolimax columbianus), Yellow-bordered Taildropper (Prophysaon foliolatum), Robust Lancetooth (Haplotrema vancouverense), and Hairy-shelled Snail (Vespericola columbiana) (Figure 5). The Wandering Salamander and all of these molluscs, except the Taildropper, had been previously documented at Cleland Island by Campbell and Stirling (1967) who visited Cleland Island on five different days between July 24 and August 28 in 1967.